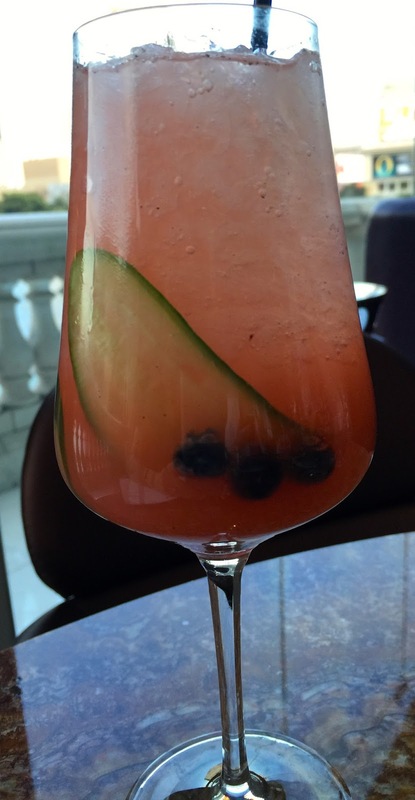 LAS VEGAS DAZE: Lago Review-Julian Serrano's new restaurant at Bellagio! 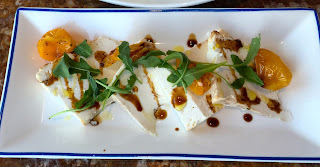 Lago Review-Julian Serrano's new restaurant at Bellagio! Lago at Bellagio is the newest restaurant opened in April by Julian Serrano. Lago replaces Circo, and the space has been completely renovated. White is the predominant color and it's very open and modern with large windows overlooking the fountains and lake. It's an energetic and very loud environment. There is also a open patio seating area such as the Bellagio Olives restaurant has and I suspect that area is not as noisy as the main inside room. There is also a side room off the main room and it might be a bit more quiet too. The menu is Italian small plates, though there are a few entrees that are larger plates as you can see from the menu below. The drink menu is on an iPad and has some very unusual and tasty drinks. We were seated in the main dining area with a window table that had a fabulous view of the Bellagio fountains and lake. Since this was our first time dining at Lago I didn't know they also had outside patio seating or I would have requested that, instead of the inside area where we ate which was extremely noisy. The photo above was the view from our window table and the photo below gives you a idea of what the main eating area is like. Cucumber Mist Cocktail recommended by our server. It's a very refreshing fruity vodka drink with some fresh cucumber and blueberries so you can feel healthy, LOL! I would order this again! 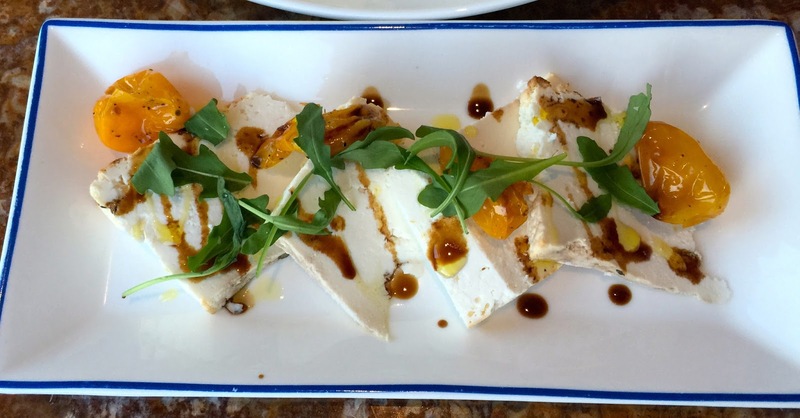 Ricotta Infornata which is baked ricotta, tomatoes, balsamic vinegar and rocket arugula. I liked this a lot and it was a decent size to share among the three of us. 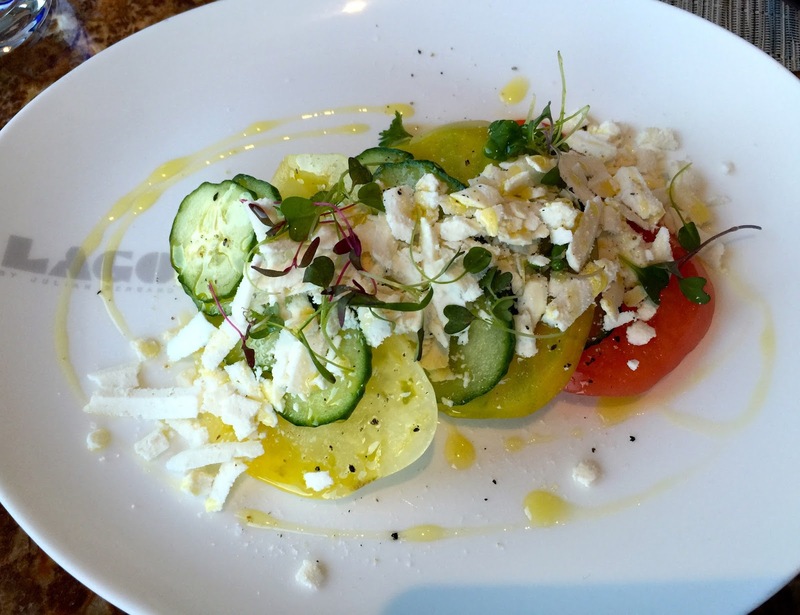 Insalata Sarda-heirloom tomatoes, cucumber with ricotta on top. Light and refreshing and the tomatoes had a good flavor. Margherita pizza, with house made mozzarella and fresh basil. There were four small slices. I didn't try this dish and Gwen said it was just average. I loved the shrimp, it was the best dish of the night! Gamberi Alla Calabrese which the menu said was baby shrimp, white wine and spicy peppers. The shrimp were medium size in my opinion and the sauce was so flavorful. While I love spicy food, this wasn't so spicy that the average person who might not care for spicy would have a problem with it. Another personal favorite of mine though Gwen and Terri didn't really eat it, was the Caponata. This is sweet and sour eggplant, onions, pepper, basil and pine nuts. Lago's version of this classic Italian cooked vegetable salad, was a dish of chilled pickled vegetables with additional items as you can tell from the photo, then described on the menu. Filetto-4 ounce beef tenderloin with gorgonzola. It was delicious, loved the red wine reduction topping. There is also a larger portion of this to order on the menu that is 8 ounces and is served with potatoes and asparagus. 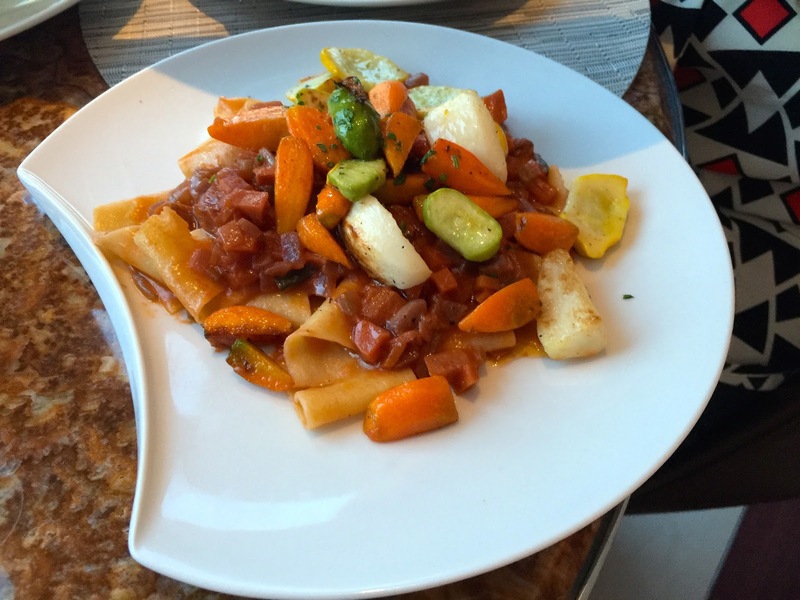 Pappardelle Al Sugo Bugiardo-ribbon shaped pasta with a vegetable ragu. I had a taste of this and it was very good! It's all about the desserts with me so here's their dessert menu which like the drinks is on an iPad. I ordered the Amalfi and Terri order the Giandujotto. After we ordered our server mentioned that these two desserts are their most popular. The Amalfi was fabulous! I would order this again and again. It's Hazelnut Praline with a Limoncello Curd, Meringue, Limoncello Sorbet and Passion Fruit Coulis. I tasted Terri's Giandujotto, hazelnut ice cream with hazelnut/chocolate cream in a chocolate shell and it was great too. Both desserts taste as wonderful as they look! We had some service issues with the bussers not clearing plates on a timely basis or refilling the water without prompting. However the restaurant was very busy. There are also some tables in odd spots or so close together in the middle of the restaurant that I personally would not be comfortable sitting at them. Despite the noise and small service glitches, all of us enjoyed eating at Lago. I plan on eating there again this summer, though I will wait for a outside patio table or one in the side dining room. Diana, I loved the review. Everything looks so tasty. I cannot believe that we stayed at the Bellagio and did not even make it there. We had every intention to go, but between meeting up with everyone and being the degenerates that we are it never happened. There is always our August trip! Thanks on the recommendations of the dishes that you really did enjoy! Hi Don, sorry you missed Lago, hope you do make it in August. I might be in Vegas the end of August but not sure yet. Have a great trip! Can't wait to try this restaurant. I am going at the end of August and wondered if the outside seating would be too hot. Do they have fans there? If you do happen to go to Vegas - would love to finally meet you and play some slots! Really enjoyed your review. Hi Karen, nice to hear from you! I don't know for a fact since I haven't sat on their patio yet but I assume it will be like Olives restaurant and they will have misters out there that help a lot with the heat. Thanks for letting me know you like the review and if you eat at Lago I hope you enjoy it! Have fun and win lots on your Vegas trip. Ask me in mid-August here if I have a trip planned for the end of August. At the moment I don't, but that might change.